In August 1951 Maithe Marshall, Leonard Puzey, and Louis Heyward all quit the Ravens. They formed a trio called the Hi-Hatters, which only existed for a short time (their only appearances were at the Baby Grand). After the Hi-Hatters disbanded Maithe, Leonard, and Louis re-joined Ricky for the Ravens' August 8, 1951 session (at which they recorded "The Whiffenpoof Song"), but this proved to be Maithe's last recordings with them. By late September, Maithe was working as a soloist, appearing at the Apollo Bar in Harlem. 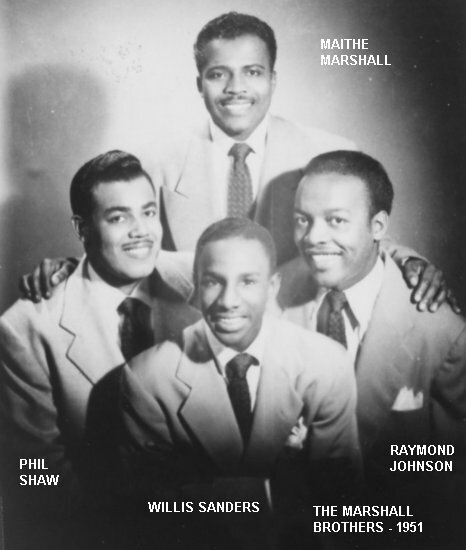 Maithe then got together with tenor Phil Shaw, baritone Willis Sanders, and bass Raymond Johnson (from the Beavers, whose pianist and arranger was Howard Biggs) to form the Marshall Brothers. 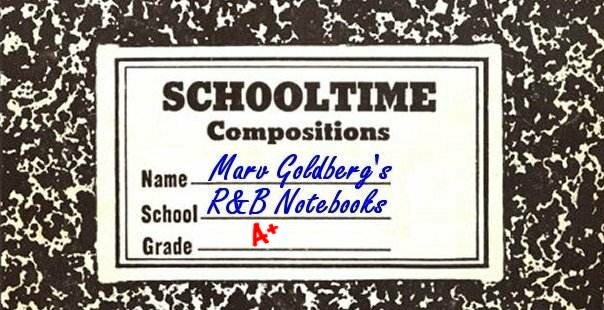 They secured a contract with Savoy and did two sessions. 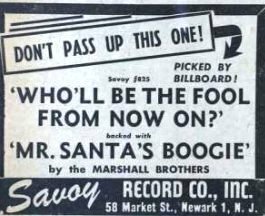 All of their released material was recorded on November 11, 1951 (including some backups to WAAT DJ Bill Cook); all the unreleased tracks were laid down on December 17. The Marshall Brothers stayed together only about four months, most of which was spent rehearsing. But when it came down to it, they couldn't get any work. 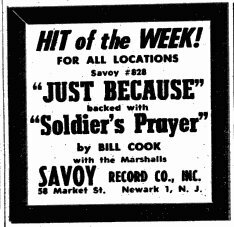 The only appearances they made were at Bill Cook's club in New Jersey. When it was over, Raymond Johnson went on to replace Bill Brown in the Dominoes (but never recorded with them), and Willis Sanders went off to form the Embers in early 1953 (but don't forget him, he'll be back later). Maithe Marshall occasionally appeared with the Ravens in 1954 and 1955, but never recorded with them again. Later in the 50s he joined some non-recording Ink Spots groups, ending up with Ollie Crawford's in the 60s.